How to predict or extend regression lines in ggplot2? I have a data frame that contains two time series: the dates and version numbers of Emacs and Firefox releases. Using one ggplot2 command it's easy to make a chart that uses loess (in a way that looks a bit amusing, which I don't mind) to turn the points into lines. How can I extend the lines into the future? I want to determine where and when Emacs and Firefox version numbers will cross, and if there's a way to show an error range, all the better. Given that ggplot2 is plotting the lines, it must have a model, but I don't see how to tell it to extend the lines, or to get the model out and do something with it. You would have to predict the values for future observations outside of ggplot2 and then plot the predicted values, you could also get a confidence interval for these predictions. Look at the loess function, although I'm not sure if it does predictions outside your data range, I'm sure some smooth function does however. However it is usually not wise to predict values outside your data range. I would not put much trust in these predictions. 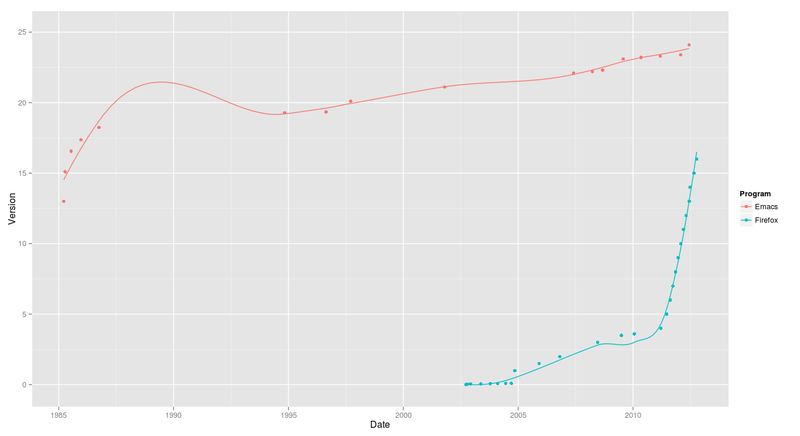 You may want to investigate predicting values using a time series model. Not the answer you're looking for? Browse other questions tagged prediction ggplot2 or ask your own question. How to add horizontal lines to ggplot2 boxplot? How to specify labels per facet in ggplot2? How can I 'dodge' the position of geom_point in ggplot2? How to effectively visualize multiple frequency polygons in ggplot2?